- No obvious pattern (florals, dots, animal prints); no logos; no denim. 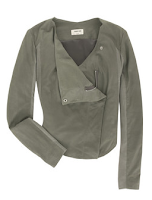 Shown, an operational definition: Helmut Lang gray paper-weight leather drape-front jacket $1,185, from Net-a-porter. 'Strict' is not a look for the faint of heart or wallet; those nearly-invisible details in the Lang jacket are pricey. The lining, for example, is made with stretch fabric. Only you will notice this, when the jacket flexes with your body. Coco Chanel said, "Elegance is refusal"; strict embodies her axiom, though the brand, overdone and tense today, has forgotten it. Here are some strict items for spring, built around grey, a usually lifeless colour in mid-priced clothes, but luminous when the fabrics (and therefore dyes) are high-quality. Asymmetric cashmere/silk v-neck sweater, Eric Bompard, €150. Grey cotton pants, Alberta Feretti, $845 from Net-a-porter. Miu-Miu draped-shoulder cardigan, $775 from Net-a-porter, who seem to have a strict-loving buyer in the house. 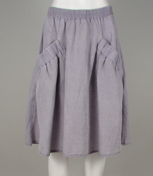 Below: Maison Margiela Ligne 6 grey linen skirt, $275 from Hejfina. note the subtle colour and pocket detail. An equally simple top: Acne impala yellow Joan, $275. How do you do 'strict' on a budget? Wait for a sale, as Pseu did, haunt resale boutiques, scan eBay, or buy one piece at a time, as the look is not about this season's hot piece. Strict shoes are harder to find in North America. 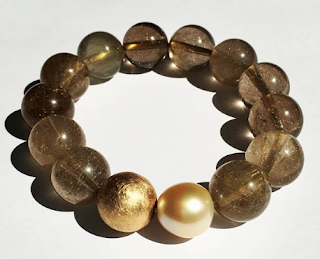 Jewelry: Not girlish or "cute" , which would vault strict into 'charmante'. Kara by Kara Ross gold plated silver python cuff, $435. I'm mad for this, and can see it worn with everything, strict or not! 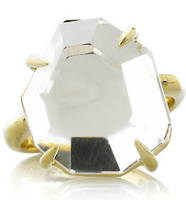 Landver asymmetric natural polished crystal solitaire ring $240, worn for day and evening. Strict isn't shy. I'd describe my own style preference these days as semi-strict. One doesn't have to be thin to carry off this look. It suits 50+ women because it's elegant, but relieved of the extreme rigour of the high-existentialists. And I'm always playing with adapting its quiet luxe to my budget, but then I'd be stuck with that reality no matter what the style! Duchesse - great choices! I'm with you on "semi-strict," need to have a little fun and color, not to mention a little bit of heel now and then. But it's a great jumping off point to edit and be selective in one's wardrobe. I'm nuts for that Miu Miu sweater, am bookmarking and will watch for sales. And I'm already there with the grey and brown; it's become one of my favorite combinations! I love gray with taupe, but I don't think a strict dress style would be something I could maintain for long. I like bright colors. :-) However, having said that I really like the gray and would love to add a red scarf to it. Duchesse, Thank you! That was very informative. Nice to learn something new everyday. Your analysis is excellent, as always. I must say I'm attracted to this style, but when I try to approximate it, it doesn't work. My hair is too messy for one thing (only beauties like Jane B and French women with great bone structure can get away with this). As you've pointed out elsewhere, all the elements must be lined up for such a style to work, especially great fit and fabric and an aura of confidence. I love all your choices here! What a fabulous an informative post. Even though I would buy any one (or almost all) of those selections could I do so, I think strict is something I admire more on others and could not pull off myself, even though elements of the style do work for me. I do agree that it is a good look for middle-aged women, flattering and elegant, and certainly would make a good jumping-off point. I am mad for that cuff as well. It could easily be one's statement piece for the entire season and well beyond. Modest: Most of use crave more colour, and a scarf would be a way to inject some. Pseu: Miu Miu make witty items; I too would wear that sweater to shreds. 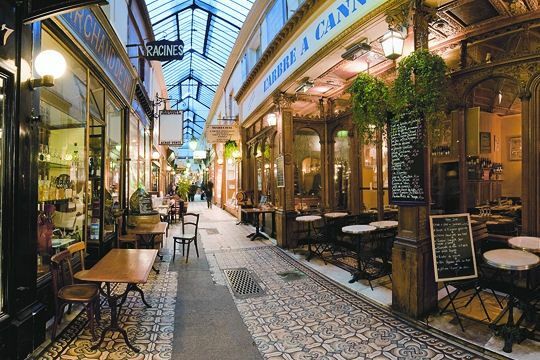 Frugal: Yes, that's why I couldn't stop staring and have studied the effect; it's uncommon. Sher: Thanks for dropping by! Well, I do think one needs to be slim to carry off this look, which is why it looks so good on French women. Can you imagine a bosom under that Helmut Lang paper thin leather jacket? Or wide legs appearing from beneath the grey jersey dress you posted in November? Absolument pas! I subscribe to your blog and especially enjoyed this article. 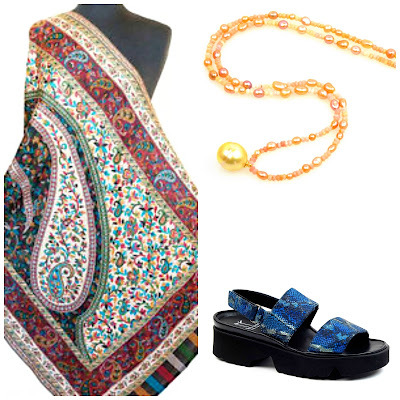 I'm very much an eclectic dressser myself and find it difficult to be a woman in her 50s and dress the evolving me. Wow - great post Duchesse. I love that jacket, the cardigan - which I would wear with everything and the ring has the quirky detail I love. interstingly, until it wore out recently, I had a top with an assymetrical neckline in an almost identical colour to the one you posted! I've never thought about this as a style - much of it I'd call Elegant chic.